The purpose of the Web-based survey was to validate the 22 requirements derived from the semi-structured interviews with a larger sample of consumers. The survey also collected information on consumers' disabilities, technology use and access, and use of assistive technology. Based on the results of semi-structured interviews we identified a set of 22 health information requirements representing personal health record (PHR) needs for people with disabilities. To validate these findings with a broader sample, we created a web-based survey and invited people with disabilities to participate. The survey was announced in several ways. We informed our interview participants about it, and asked them to share it with others who might also be interested. We asked influential members of various disabilities communities to share the information with their contacts. And we announced the survey on a number of email lists with substantial membership of people with disabilities, including membership organizations for people who are blind or deaf. The survey was also listed in the weekly newsletter News and Notes from the NIDRR Community and Beyond and on U.S. federal accessibility lists. The survey was centered on rating each of the 22 requirements by both importance and current level of satisfaction in managing the task(s) described. The survey also collected background information on consumers' disabilities and their use of technology and assistive technology. It was critical to create a web-based survey that was fully accessible to users of assistive technology. In our experience, few vendors provide accessible online survey tools, and even among those who seek to address accessibility, additional modifications are often required. We used the Survey Gizmo tool and added additional labels and structuring to the HTML to ensure ease of use for screen reader users. We tested our survey using both accessibility checking software and with a screen reader user. From our testing we made adjustments to the HTML code of our survey to improve accessibility. Though anecdotal, we did receive unsolicited comments from participants that the survey was accessible and that our efforts were appreciated. We chose to pursue option 3, Soft Required, realizing there was a risk of incomplete data but deciding that this was less important than the risk of denying some participants the ability to submit an incomplete survey if some questions proved to be inaccessible and/or difficult to use. The complete survey text is provided in appendix B. The survey was built around ratings of the twenty-two requirements where each requirement was rated in terms of importance and current level of satisfaction. The survey included additional questions on participants' disabilities, use of technology and access to assistive technology. Questions for rating requirements on importance and satisfaction as well as questions on the use of assistive technology used a five-point Likert scale. Questions on participant ability/disability used a combination of nominal and binary variables. By design, participants responded to all disability questions so the results could be compiled to identify people with multiple disabilities. We included questions on the use of technology where participants rated their frequency of performing a number of technology activities (using email, shopping online, etc.). Additional questions on technology access were presented as binary Yes/No questions. Finally, participants rated their satisfaction with technology independence and access to assistive technology using a five-point Likert scale. Survey results were exported from the survey site as a csv data file and organized in Excel for identification of incomplete records, calculated variables and descriptive statistics. A statistical analysis program, SAS, was used for additional analysis. Due to the limitations of our sample (n = 150), we made the following conversions in order to run comparison tests. Disability question responses (Questions 39-41) were converted to binary variables by combining the affirmative responses ("Blind" with "Some visual impairment", "Deaf" with "Some hearing impairment" and "Severe Physical Disability" with "Mild Physical Disability"). We also converted the five-point Likert responses for questions 1-22 (requirements importance), 36-37 (technology satisfaction), 45-66 (requirements satisfaction), to binary variables (Very satisfied/Satisfied, Neutral/Dissatisfied/Very Dissatisfied as 0 and Very important/ Important as 1, Neutral/Unimportant/Very unimportant as 0). This section describes our survey results. 195 people attempted the survey, but only 165 actually completed it (where completion was defined as working through to the last screen of the survey and clicking the "Submit" button). Thirty incomplete survey responses were eliminated from the analysis. Of the 165 who completed the survey, 14 people had a high degree of incomplete data where entire screens were left incomplete. No significant difference in results was noted, so these 14 responses were eliminated from the final analysis as well. One respondent reported in the comment section that they had no disability whatsoever, so this response was eliminated. The final n = 150 participants. 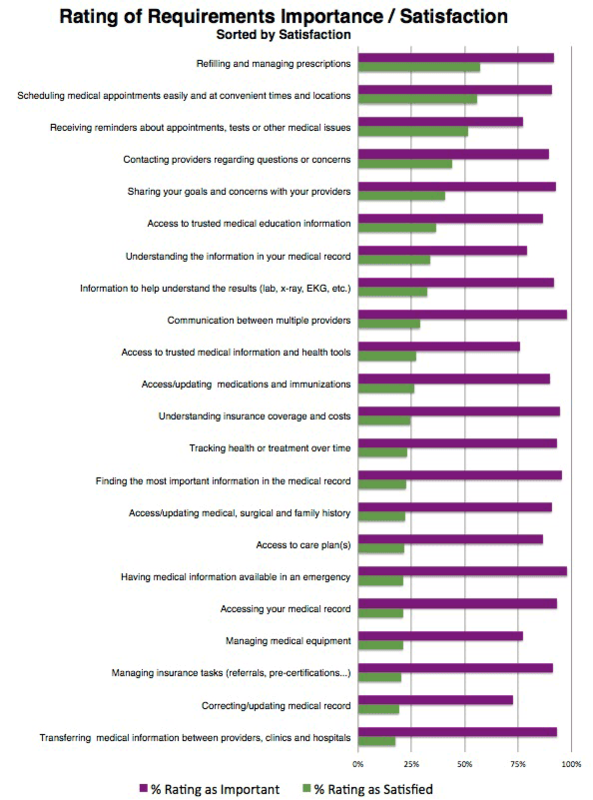 As shown in the bar graph and data tables that follow, all 22 requirements were rated as important (98% to 72% of participants rated each requirement as either Very important or Important). In contrast, all of the requirements were rated low in current satisfaction (57% to 18% of participants rated each as either Very satisfied or Satisfied). We created a calculated field, "Multiple disabilities," for subjects who responded in the affirmative to more than one of the five disability questions. We combined affirmative responses to the disability responses to create binary variables for each. These binary variables were used in the Comparison Tests section below. I type with a mouth stick on a Maltron adaptive keyboard. I cannot upgrade my cell phone because the new phones cannot be used with my mouth stick because it's not skin touch. I'm a single mother of 2. Need I say more? I have depression and ADHD. Need more help with my mobility issues. It's great so see some one looking at overall access to healthcare. I would like it if there was my Doctors communicated w/ each other more, to provide an increase in continuity of care. Some questions needed explanation but there was no way to do it. The selection buttons were not designed properly and I had to guess. Under Vision, there should be a Legally Blind answer as there are great differences in “visually Impaired”. 30 to 40 % disabled in both upper and lower extremities. Legally blind. Less than 5% peripheral vision in each eye and the additional complication of cataracts. I am not sure if I consider blindness a physical disability, but would rather consider it a challenge. I have Type 2 Diabetes with Neuropathy and occasional balance issues. I have Type 2 Diabetes with Neuropathy and have lost a lot of high frequency hearing. Totally blind. No light perception. searching for “deafened” among choices, not there; also where is Q re confidentiality of all medical records? and all features you are researching for online access?? I have a slight coordination problem. My physical abilities are reasonably fine, but I do wish there were accessibility instructions with the combo boxes. I am actually deafened, but with a high-power hearing aid and a cochlear implant I function as a mildly hard of hearing person. Cochlear implant user - so function as hard of hearing, but am physically deaf, and have no hearing without my cochlear implants. This impacts medical treatments and functioning in hospital situations. I am 74 years old. I exercise regularly and people comment often about how young I look. Absence of limbs. Difficulty with keyboard & mouse (particularly phone touch screen & touch keyboard). Hearing and vision need broader categories i.e. wear corrective lenses, hard of hearing w/0 hearing aid, hard of hearing with hearing aid or Cochlear implant. actually I am more than mildly mobility impaired but not paralyzed, you should give more choices here. Ditto with deaf. I have some hearing loss but you had no choice for that. I don't think you asked enough complex questions or enough questions to accurately measure the need of the disabled population in this regard, nor did you ask some of the needed questions. I.e. how many people in your household are disabled? What sorts of adaptive technologies do you need to access the internet that you do not have? Do you feel personal data is secure online? etc. I'm extremely bright (or so I've been told). However, I have processing speed issues, as well as visual tracking issues that interfere with my ability to do things in a timely fashion and sometimes I am not able to keep up with the task b/c of these limits. For example: At work the phone is set up so if you don't get the phone # you are calling inputted in a few seconds it cuts off (b/c of some visual problems, I have trouble finding a specific number or word on a page with other writing on it and I can only remember 4-5 digits at a time). Unless I know the number by heart I often have to make 4-5 attempts before I'm fast enough to have the call go through. I just need another 4 seconds of input time and this would not be a problem. My home phone allows me to put in the # before I have to send so I don't have this issue there. Visual and auditory input is often overwhelming and malls and airports are difficult for me to tolerate for more than a half hour, especially if I am by myself. I am a manual wheelchair user for long distances and a user of Canadian Crutches for shorter distances. I am a very active individual who strives to participate in community activities but often encounters barriers within and across the environments. it is very important that i have access to all my doctors, records, and working together, but that is not reality. Perhaps the “other” set of Q is how much are you getting now. I have no hearing loss, because of my TBI sometimes volume that is normal for you is SCREAMING for me. I have MS and very involved in disability issues in general. I have been able to email my Doctors at UPMC. I have found this to be very helpful! I don't have insurance, so for me to schedule an appointment to see a doctor, that is even difficult for me to do. Blind people almost never have access to the forms required to be filled out when arriving at medical appointments. Front line staff almost always resist reading the forms aloud to me. neither front line staff nor most doctors and nurses know proper sighted guide technique; instead, they pull and push me around. Medication packaging and information are currently completely inaccessible to me as well. I truly understand that this is mostly about PHYSICAL health concerns for disabled persons, but will there be any inclusion of MENTAL health concerns in this particular project? The questions that refer to accessing the “care plan” developed “for” you should be changed to “treatment” and “with”. The plan involves the best treatment strategies that are developed with the person. I have a reasonably secure computer system. I worry that most, do not and do not understand about how easy it is to become trapped in the often confusion of what or how things are written or asked, therefore compromising the entire accessible system. The government is sorely remiss in their security of such technologies. I'm not happy with the possibility of losing my health records to someone I don't know or don't wish to have them. How do we get past that? It would helpful to receive a readout on the results of medical tests with information explaining the positive or negative aspects recorded. This would allow the patient time to think over the results and formulate any questions or concerns they might have and want to address with the doctor. My responses may not be typical of a research subject as I was a clinical pharmacologist before losing my sight. What I consider important is probably weighted by my prior experience and knowledge of medicine and the health care system. I would like you to consider asking about the abbreviations used by health care providers that the average person wouldn't necessarily be familiar with. I'm not always sure what they mean. Also, you might consider asking about the accessibility of formats such as charts, tables or pdf documents created by medical records personnel. "How important is it for you to have medical information in a format you can access independently?" You should have asked if I am in good health currently. If I am, then many of the issues about which you have questioned me will effect me differently than if I was in bad health. As I am currently in very good health I have nothing to do with my doctor, specialists, insurance claims, prescriptions or any medical matters at all. I have had medical concerns in the past, e.g. high blood pressure (lifestyle/diet related) and I broke my arm. At that time certain particular aspects of monitoring and supervising my own health management had challenges. As technology and the awareness of accessibility requirements grows, the task of managing my own health issues becomes easier. Why aren't products like SpeechMED encouraged? the most important is needing an advocate to assist with gathering all the specialist information and making sense of what is needed. Because I am deaf, the only way to book an appointment is to drive to the office and stand in line to make it... cancellation is almost impossible... referrals to specialists are very difficult because I have to make another trip to my doctor to find out what the other doctor has phone back about and then find the time or date does not work for me. I live in my own apartment, but my parents are still pretty much involved in managing my healthcare needs with some exceptions. I would like more attention paid to the issue of transportation to and from as well as there be some kind of standard so you can tell how long I would be waiting and when I might be able to leave. Doctors who use email for communication, and answer promptly, make it easy for someone with a hearing loss to communicate - an important consideration. Better info on DME providers and how to receive DME repair or replacement. Do you have access to the medical record at all? Do you "trust" interfacing with your medical record on-line and how confident are you in the confidentiality of it. I do not currently have any access to my medical record. My provider will let me know sometimes by phone that a lab test is normal, but doesn't share the actual lab value or normal range unless I request that it be mailed to me. AT PRESENT I AM VERY SATISFIED, HOWEVER THIS HAPPENED WHEN I WAS OLDER. WHEN I WAS YOUNGER AND MY ISSUES BEGAN (PAIN IN MY JOINTS, STOMACH ISSUES AND HAVING HEADACHES REGULAR) IT SEEMED LIKE THE DOCTORS DIDN'T BELIEVE THERE WAS AN ISSUE (LIKE CAUSE I WAS IN MY 20'S THERE WAS NO WAY MY JOINTS, STOMACH AND HEADACHES WERE IMAGINARY) ... I FIND THIS SAD BECAUSE SOME OF MY ISSUES COULD HAVE BEEN ADDRESSED EARLIER IN LIFE AND MAY NOT BE AS BAD AS THEY ARE. Many people have hidden disabilities and others do not understand how you can be so smart and then be unable to do a certain specific task. Often it only requires only small changes in how technology interfaces with us to make it work. Thank you for doing this study. You failed to address several key factors in your survey. You have no questions that control for social desirability. You completely neglect important variables that can impact the validity and trustworthiness of the responses you get. For example, you have no questions on the degree of trust that a person with a disability has about keeping their information secure and confidential. Making health-related information available for people with disabilities to access and manipulate online in a cloud environment is the relatively easy part. If people with disabilities do not trust that their information will remain secure and confidential and not be shared with others without their permission, then it is unlikely that individuals will use any online system. Due to the current closed records laws, my adoption status keeps me from knowing or having important medical history. sec 2 Q 4. do I have a “care plan”? what is this? something over and above, take the Rx until the pill are gone? I use a lot of alternative health care and do not have a primary physician and haven't had for several years. i go to the dermatologist and surgeon to have skin cancers removed annually as part of my health condition. This is not a short survey. It demonstrates how helpful electronic health records could be. I just went off SSDI disability, and got notices of my Medicare needing to be paid for a whole quarter at a time. Of course, this will be retroactive, and I don't have that kind of money. I may lose my Medicare just because nobody has told me anything about the quarterly thing in a timely manner. You have not asked what types of medical records I have access to. This is a major flaw in this survey. You don't know whether I have personal records in a structured electronic system that is mine or whether my records are free-form notes, and you don't know whether the records I rely on are maintained by my doctor, a hospital, another healthcare provider, or are records maintained by a third party such as Microsoft. You also have not asked and don't know my concerns over privacy and security of my medical/health information and the conditions under which I want them to be accessed. Continued text formats that can be read by screen readers. very limited equipment providers for higher end power chairs -- been trying to replace a 9-year-old power chair for nearly a year... and I have good health insurance. you have questions about insurance, but you should consider that public insurance systems are what most people with disabilities and the elderly interact with. Information contained within those systems is crucial to access and it is medical information. Many participants (interview and survey) expressed concern about possible differences between people with different disabilities. When it comes to specifics of accessibility and assistive technology there are certainly critical differences between people with disabilities. For example a person who is blind requires different forms of assistive technology than a person who is physically disabled, but even between people who are blind, each may have different preferences or capabilities. However, when it comes to broader issues concerning health related tasks and information, we suspected there was little difference between people with different disabilities. To test this, we ran a series of comparison tests on our survey responses. In response to the question, “Please rate the following items on how IMPORTANT each is to you and your healthcare: Understanding the information in your medical record” participants who indicated they had a visual disability responded this was more important (100% important) than those without a visual disability (94% important), p=0.0476. In response to the question, “Please rate the following on how SATISFIED you are with your current ability to perform each task: Contacting your doctor or other healthcare providers any time you have a question or concern” participants who indicated they had a cognitive impairment were less satisfied (23% satisfied) than those without a cognitive impairment (48% satisfied), p=0.0350. In response to the question, “Please rate the following on how SATISFIED you are with your current ability to perform each task: Contacting your doctor or other healthcare providers any time you have a question or concern” participants who indicated they had multiple disabilities were less satisfied (30% satisfied) than those with a single disability (52% satisfied), p=0.0106. In response to the question, “Please rate the following on how SATISFIED you are with your current ability to perform each task: Having information to help you understand the results of any test or result” subjects who indicated they had a visual disability were more satisfied (42% satisfied) than those without a visual disability (21% satisfied), p=0.0130. In response to the question, “Please rate the following on how satisfied you are with: Your ability to use a technology independently” participants who indicated they had a visual disability were less satisfied (72% satisfied) than those without a visual disability (87% satisfied), p=0.0414. In response to the question, “Please rate the following on how satisfied you are with: Your having all the assistive technology you need” participants who indicated they had a visual disability were less satisfied (48% satisfied) than those without a visual disability (66% satisfied), p=0.0306.